Things are cranking away in the garden right now, its absolutely wonderful! 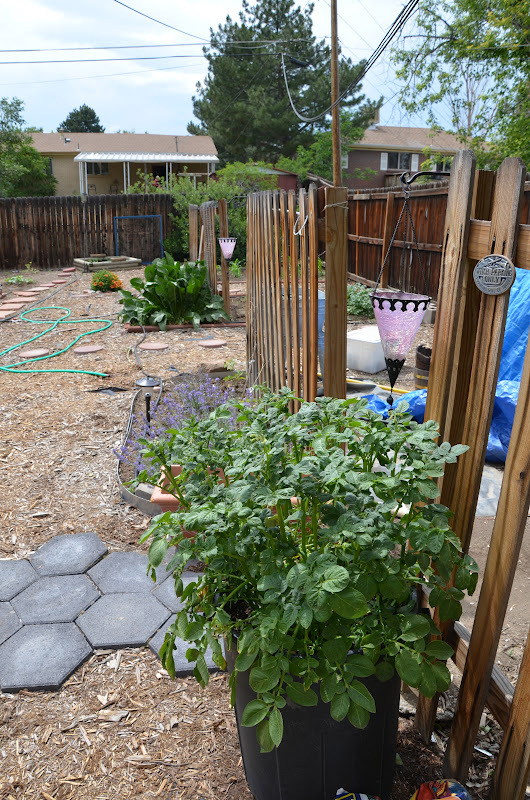 The first blossoms popped up this weekend on the okra and squash, and the potatoes are flowering already! 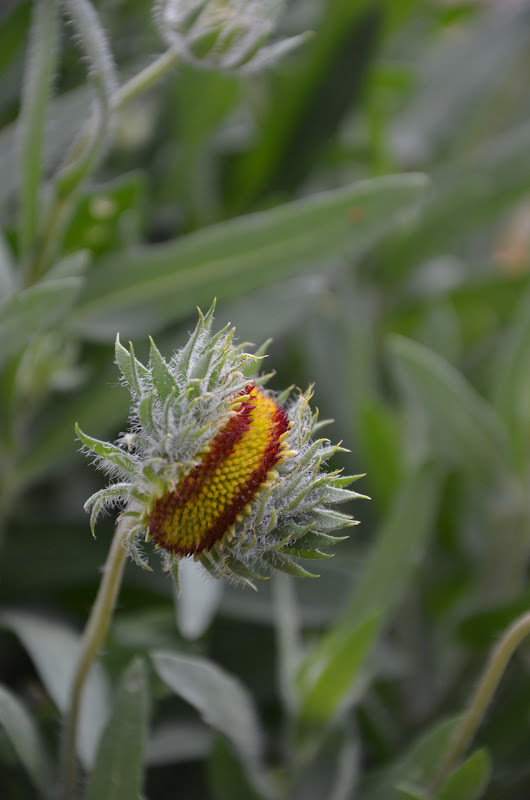 This blanket flower has mutated into kinda a triple head, its very very cool to watch it do its thing. The stem on that one is about 3 times the size as the others as well. Nature is amazing.The temps of 95+ the next few days should help the peppers, but my poor lettuces may get wilty, I need to find a covering for them. All the garden beds are full now, when I am starting my seeds it always seems like I will have way to much, then as I plant, I think, hmmm, I can make more room over here. Thats how I have now ended up with 14 beds...and plans of course for more. I have decided that all squashes need their own round beds, and that some of the existing beds with the fences need to be perennial things. I had hoped to have all the beds nailed down by this summer so I could start putting in permanent stone semi-raised walls for them, but I just seem to keep finding room to add more beds, :) which is okay, I just need to take a summer and make them all permanent. I also learned this week that you can hand pollinate squash, (and other plants I am sure) I have never tried that, but it might interesting to see if I can do it. The peas are coming in nicely they are at least 3 feet tall now and producing many many delicious little pods. I have tons of tomato plants, including a few donor plants from my friend Marsha that are climbers. I have never tried that with Tomatoes, so it should be a learning experience for me, but I am excited for it. The potatoes have grown completely out of the trash can. I neighbor told me he tried it last year and it did not work so well, that they were to crowded and ended up small. he suggested that I just rip them out now and plant them in the dirt, but I think I am going to stick with this and see how they turn out. On another horseradish note, it has now taken over the garlic, which is not cool, but since I can move the garlic at the end of the season I think that horseradish will be declared the winner yet again. I have such a love/hate relationship with that plant! mmmmm wish it wasn't so tasty! 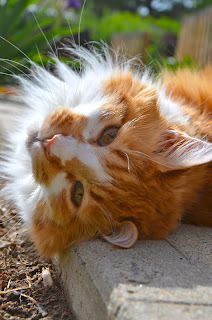 As always, HRH Arty hung out in the shade while I worked this weekend in the yard. He is such a goof. Also want to send a shout out for prayers and happy vibes to my Cousin and best friend Lisa who lives in the Poudre Canyon here in Colorado. The canyon is on fire right now, and we are hoping for the best. I was able to make a run up and bring home some her things just in case, but keep them, and all the residents up there in your hearts. This is a shot of the fire as I drove up on Thursday to get a truckload of stuff off the mountain for my Cousin and her family. This is my Cousin Lisa, Justin, and Jordyn over there on the John Deere. They have a lovely 100+ year old cabin right on the river, my thoughts are with them and all the other family and friends in the Canyon, hang in there guys!! Much love, have a beautiful day! I can't believe I went over a month without posting, so much has been going on that I just did not have time. Things in the yard are progressing very nicely, but I did have a few bummer things happen. The cotton I was growing died and I was not able to plant it outside this spring. I am really bummed about that. I created 5 new beds, which felt like a lot, but as I started planted all my seeds and seedlings, I realized I actually need more beds. ;) luckily there is lots of space for me to get a few little sneak attack planting spaces in. The squash and zucchini will have to be moved, so I am going to make new beds for them. There are many things I need to get done in the yard this summer, one is a shed for sure, and greenhouse. The greenhouse may be put on the back burner for awhile, but the shed is a must. I have to many yard tools taking over the garage. My Dad is helping me figure and put in a water and drip system, which is amazing. It is such a nice relief to not have to hand water everything every morning, I've been doing that for three years, now all of a sudden with a watering system in I feel completely spoiled, and I have to admit, I love it! There are many things to update on this blog, but I am going to start small, and just cover a few things for now. The potatoes that I started in march are absolutely going crazy and already have grown to the top of the trash can. I am so excited I can't stand it! Aslo on the potato front, the ones I left in the ground started popping up through the dirt last week, I am super excited about those! I got some new blanket flowers for the new flower beds I created in the front yard, and this one seems to have a mind of its own. The flowers are blooming solid yellow with a tiny bit of red near the center of the flower. They are beautiful, I hope they keep this coloring. This plant is one of my favorites and I now have 3 in my yard. They are so bushy and flower all summer, they are awesome. 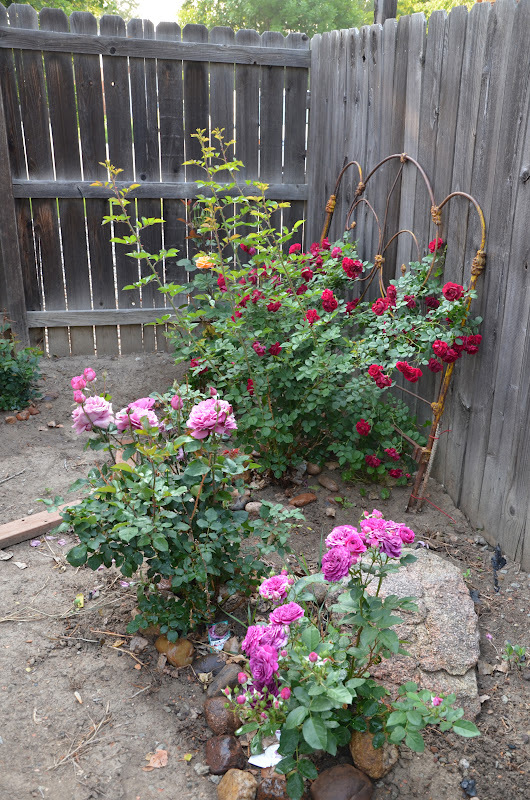 I planted 3 new rose bushes, so now I have total of 9 in the back and the one in the front yard. 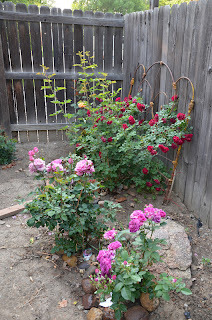 This photo is of last years roses blooming like crazy with this early spring we had. They are so pretty, I have pink, red, yellow, orange, white, and lavender roses growing back there. More to come on the new bushes soon! I took a break from work and went to the Denver Art Museum with my friend Marsha last week, what a breath of fresh air for my heart and soul that was! I love it, not only did I get to spend time with a great friend, but the art just woke me all up inside, stirred things that have been kinda frozen inside for a very long time. 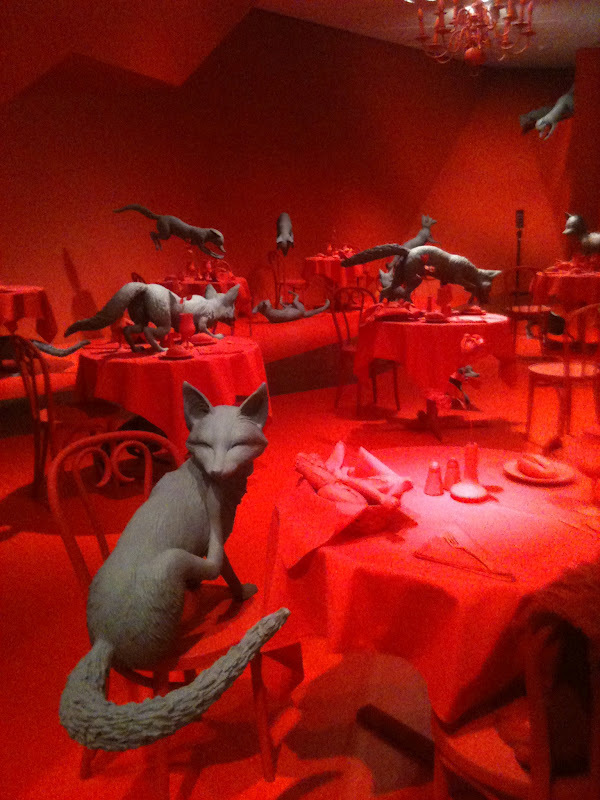 This piece by Sandy Skoglund, called Fox games, was so strange that even now, weeks later, I am trying to figure out if I liked it or if it was to creepy for me. At first, when you are in the new DAM, its very overwhelming in the new space, that building has not one straight wall in it. Its like walking through an MC Escher painting. It got me kinda dizzy, and actually made me feel sick to my stomach. We nick named it the MC Escher vomit vertigo room, it was unsettling. All the walls are white, with art kinda tucked all over the place, and at one point you can look over the railings and down at this piece by Sandy Skoglund, it just jumps right out at you. 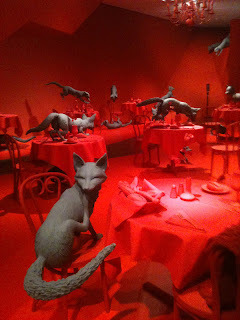 The bright red with the grey foxes against it is just so stark. You can walk through this piece, as you do, you actually cannot see some of the details, you only notice them once you are kinda out of the piece, the red almost made eyes throb. All in all, it was a fantastic field trip, just what I needed, wonderful time spent with a creative fun friend to get the sparks going again for my creativity, aaahhhhhh art is so awesome, love it when it moves things deep inside! And of course, HRH Sir Artemis loves being outside laying around in the spring sun. Have a beautiful day!